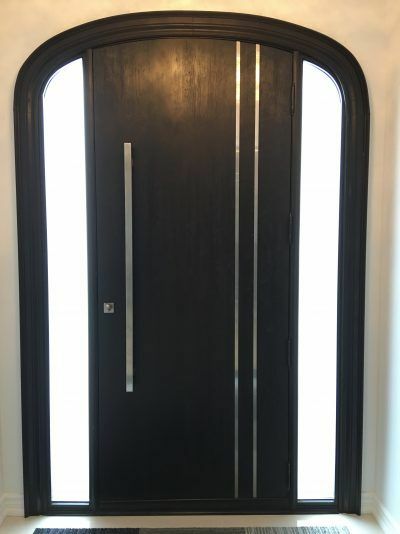 Modern Doors in fiberglass - Home Decor Window & Door Centre Inc. There are various styles available to choose from when replacing your existing front door. 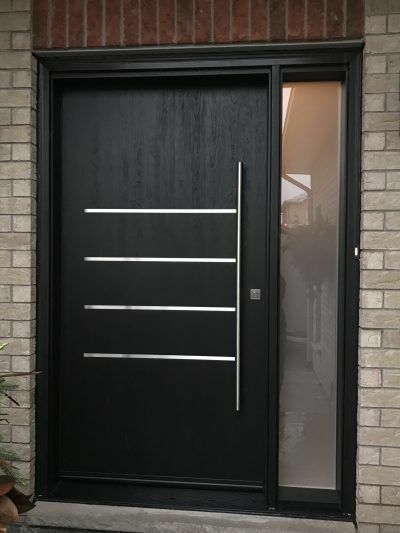 Our fiberglass modern door slabs with stainless steel inlays are built with a thicker fiberglass skin. 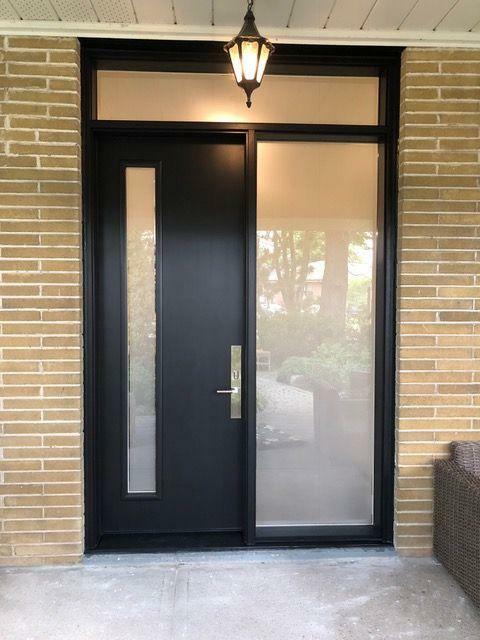 The reliablity and durability of our modern looking fiberglass door systems cannot be compared with other products available on the market. The doors are made locally in Canada. Our manufacturing process and highly skilled craftsmanship certainly provides tremendous value and satisfaction to our customers. We make stunning front doors. We can build any door configuration whether it is a double door, single door with sidelites and transom. We will discuss your options in detail so you can get a good understanding of what would work under your circumstances. 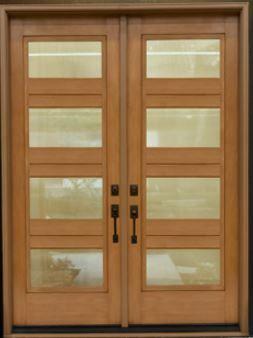 Our high end fiberglass doors will in no time make steel and wood doors less and less prevalent. A visit to the showroom and factory will give you an opportunity to see what we do and determine for yourself how refined our work is. 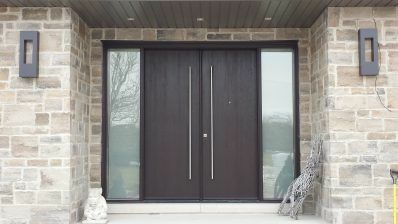 Our modern exterior doors come smooth or with a wood grain texture. The wood grain texture and our top quality stain gives our doors a rich wood look. The stainless steel that are mounted on our doors come in a few styles. These modern doors work equally well in both modern and traditional homes. Choose our custom front doors and see the perceived value of your home go up. 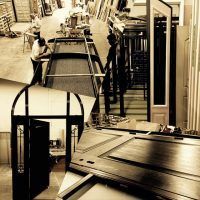 Every little detail about our doors demonstrates our commitment to quality. Choice of colour, door style and accessories, all play an important part in enhancing the look of your home. We produce quality doors. The doors we have on display in our showroom will give you a very good idea of the potential transformation your home will undergo. We are a reputable and highly viewed company. We realize customer knowledge of what a good door should look like is somewhat limited. Take the initiative, come see us for an educational tour. 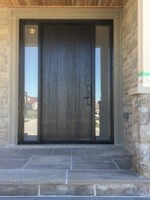 Why choose our fiberglass doors? We make the most reliable front door. The fiberglass doors look like wood. 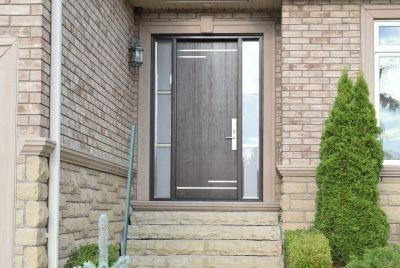 Our fiberglass doors are made in Canada, offer superior strength and durability compared to steel and wood. Highest energy efficiency rating of R20 compared to other doors. Our special stain or paint adheres really well to the fiberglass skin and offers many years of use with no maintenance. Even with full all day exposure to the sun you probably would need to revarnish or refinish the door once every 8 years. No warp under extreme temperature variations. Our workmanship is hard to beat. We are the envy in the door industry. We can only tell you how good we are, but you would need to come to our showroom and factory to see it for yourself. Not a lot of companies do what we do and we are extremely proud of our work.